Beyer, a former columnist for the Washington Post, created the Beyer Rating System more than 30 years ago. It is a speed rating system that takes into consideration many factors that are far too complex for me to delve into in a single column. Suffice it to say Beyer did his homework. A fan of horse racing from his youth, he studied horses deeper than any handicapper in the history of horse racing. He learned about acceleration, track bias, weight and so many other things that he far bypassed his fellow handicappers. I first began using the Beyer Rating System about a quarter of a century ago. I was living in Phoenix less than four miles from Turf Paradise Race Track. When Turf Paradise bored me, I would hop into my car and drive to Las Vegas four hours away. 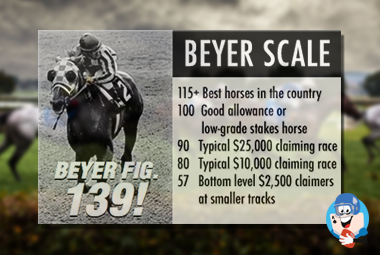 The Beyer Speed Rating System is carried in the Daily Racing Form and other racing programs that subscribe to it. You can easily recognize it from the other numbers on the page next to the horse's names because it is published in bold face print to the left of the page. Using his recipe for calculating a horse's true speed in a race, Beyer assigns a speed rating number for each race. Ratings can range from the early 40s to as high as the 130s, which are reserved for the fastest horses. Let's say Beyer gives the horse a 79 rating for the race. I make my calculations by checking how the horse finished in that race. If it won by three lengths, I add the number 3 to the figure. Then I check the length of the race. If the race was longer than today's race, I give the Beyer Rating another positive number to make it 80. Then I look at the weight. If the horse is carrying less weight today than in that particular race, I add another number. If it is carrying more weight, I subtract one or more points. I do this for the horses's best rated races. Whatever horse ends up with the highest numbers, that is my selection. I have often chosen horses to win that have speed ratings four points or more higher than their opposition. Each point is generally worth a length in a race. It has tickled me when my horse wins by the exact number of points that I come up with. On a Saturday at The Orleans Race Track, I remember parlaying two horses across that board. I won the bet and l pocketed more than $1,200 for a $50 across the board parlay. It has been my personal experience that the Beyer Speed Rating does not work equally well for all race tracks. You need to do some calculating on paper at first to determine which tracks work best for you and then stick to those tracks. My personal favorites at Gulfstream, Tampa Bay and Penn National. 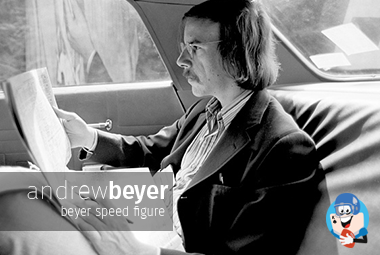 Andrew Beyer's speed rating system once helped me win over $20,000 in a poker tournament at the old Riviera Casino in Las Vegas. Stanley Reeks was hosting a series of tournaments which he called Gold, Silver and Bronze. I wanted to enter one of them but didn't have enough money for the buy-in. With my last $20, I invested in a horse that had the highest Beyer Speed Ratings and watched as my 7-1 choice wired the field. I took the money, made my buy-in, and won the tournament. Give the Beyer Speed Rating a try. And let me know the results. Good luck and good racing.